Light Peach Sakura, one of the signature pieces at Bonheur. 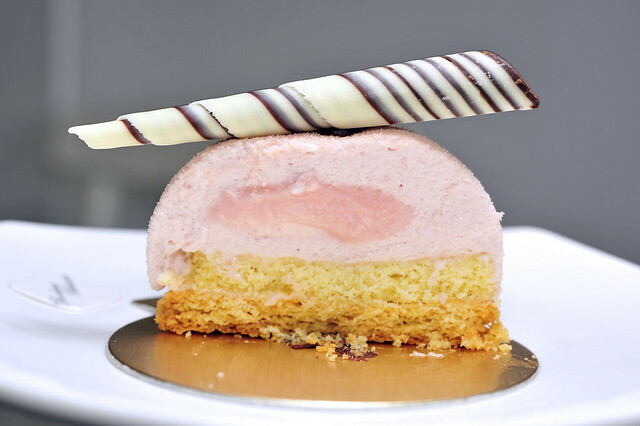 A domed light peach mousse with a sakura infused chocolat blanc centre, resting on a piece of butter pound, with a pâte sablée disc as a base. The sweetness coaxed from the peach mousse and the aroma it exuded was most delightful! Light and dainty, the flavours were refreshing and not overpowering, not to mention very novel in pastry making as the “peach” theme is surely uncommon in desserts and confections. Minus an assortment of konnyaku jellies and chewy candies from Japan and Taiwan, I’d not tasted a peach-flavoured piece in a proper piece of pastry prior to this one. Have you? 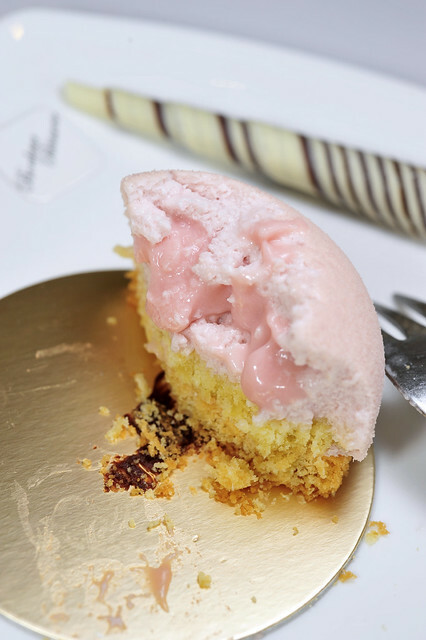 The sugary sensation was kept in check with a hint of savory from the pickled sakura blossoms-infused white chocolate centre, adding a tinge of “wagashi-ness” to it. For me, a dessert should not only be about being sweet. Additional dimensions of savory, and sometimes acridity and bitterness are also appreciated to gel the piece together. I’d also tried the Valrhona Chocolate Tart for contrast. 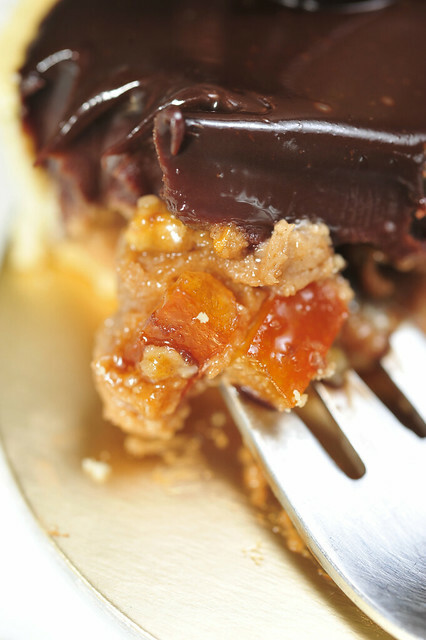 Valrhona Alpaco ganache with morsels of candied orange rind and caramelized hazelnuts with a layer of hazelnut cream. 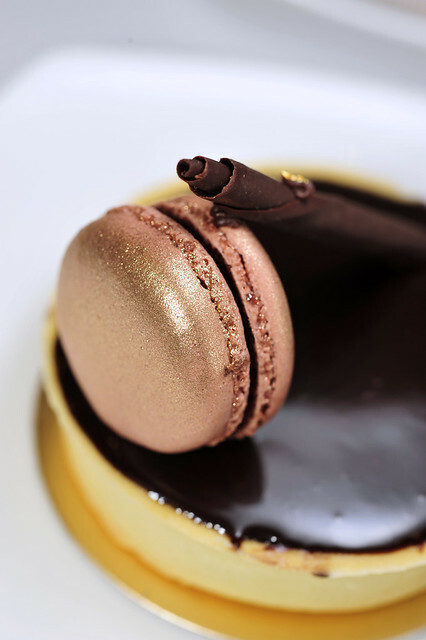 The tart is crowned with a lavender-infused chocolat noir ganache macaron and a curled chocolate decor. The ganache chocolat noir used 66% cacao Valrhona Alpaco, embellished with candied orange rind and caramelized hazelnuts, a very “safe” combination of components which go well naturally. 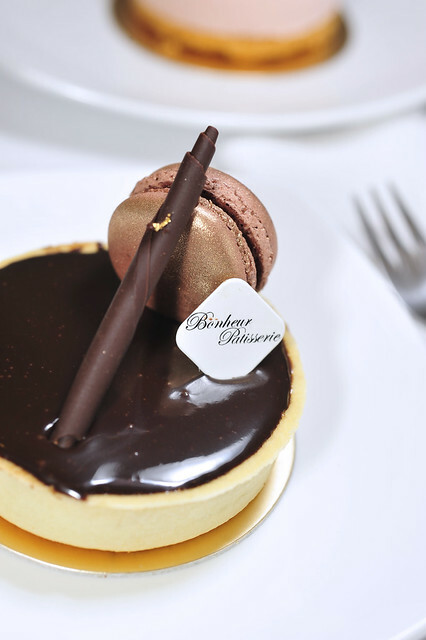 This is a tart to be individually savoured by a serious chocolate lover, or shared with a friend over a mini degustation. On its own, its probably a tad too rich to be enjoyed on one’s own but that said the piece is very well-executed technically. Sounds a bit ironic I know! 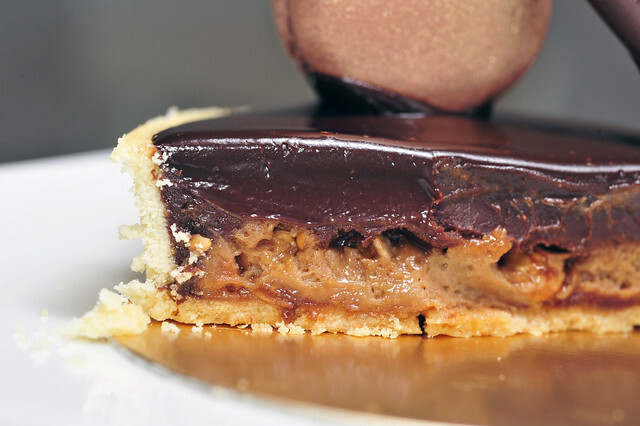 Cross-section view of the tart revealing the innards – layers of rich ganache over a creme au noisette. Morsels of candied orange rind held within, sending wafts of citrusy perfume as one bites into them. The lavender infused macaron was delicious, especially the soft floral textures it imbues. Overall, two rather enjoyable pieces for sure. Unfortunately, the light peach sakura mousse is not available at the point of writing, due to the AVA ban on JUPE products, which includes the light peach concentrate used in the mousse. Such a shame really as it is a really beautiful piece both in appearance and taste. JUPE’s products were found to be contaminated as its production plant was unfortunately located within the range of Fukushima nuclear power leakage, following the tsunami aftermath. So let’s keep our fingers crossed and hope that the ban would be lifted soon for us to enjoy the mousse cake once more! 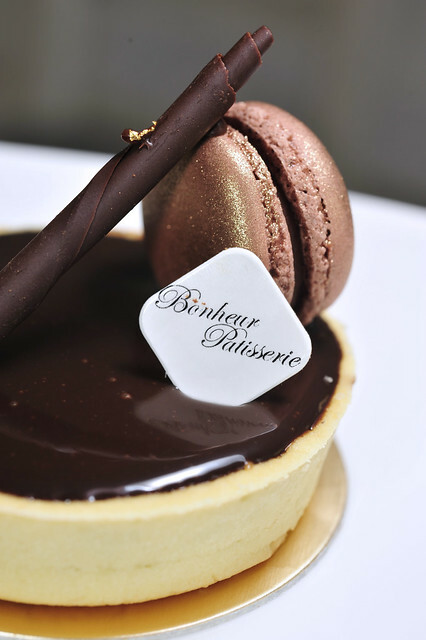 On a more positive note, Chef Lin Wei Xian who helms Bonheur has made revisions to the chocolate tart, using an improved recipe for the tart shell, i.e. Chef Stephane Glacier ‘s recipe for pâte sucrée aux amandes, incorporating ground almonds for extra flavour and aroma. 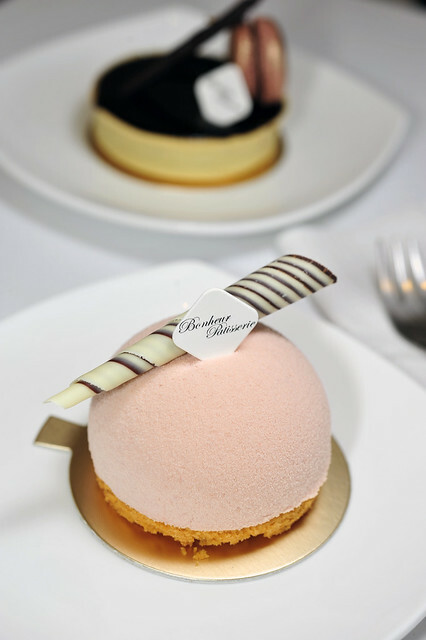 Looks like I’ll need to make another trip down to Bonheur to try it soon! This entry was posted on February 27, 2012 by Alan (travellingfoodies). 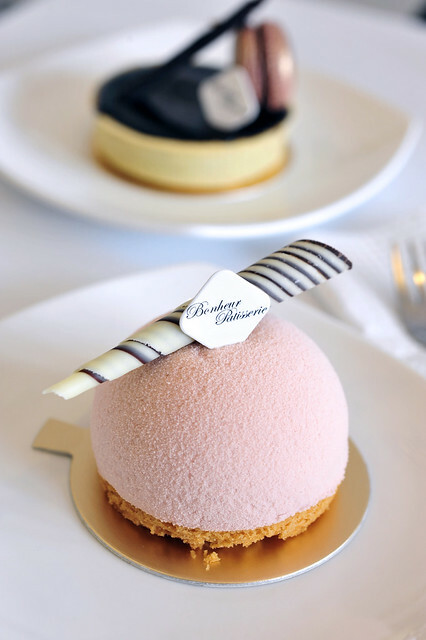 It was filed under Food and was tagged with alpaco, Bonheur Pâtisserie, candied orange rind, caramelised hazelnuts, confectioneries, creme au noisette, Duxton Road, ganache, JUPE, light peach sakura mousse, macaron, pastries, pate sable, pate sucree, stephane glacier, Tanjong Pagar, valrhona chocolate tart. Does this mean that you will post recipes up? I’m not sure what this ban is. I know it wouldn’t be peach but could you use another flavour close to it? ditto on the shell colour. Like you, i’d always preferred something more robust in colour! flavoured shells would be even better! Think Hugo & Victor’s Tarte aux Fraises! I don’t mind the colour. It brings of visions of delicately light moussy, airy, melt in your mouth deliciousness.